When I was a child, my dad would often say that a bumblebee is a reminder that nothing is impossible. A bumblebee doesn’t look like it should be able to fly. Its tiny, thin wings don’t appear strong enough to keep its fuzzy, round body in the air. Yet the bumblebee flies—proving that appearances can be deceiving. For this reason, the bee has become a personal reminder to me that despite what I may see or feel., there is always hope. When we are overwhelmed by a situation that looks impossible, it is sometimes difficult to see hope and possibility. Sometimes, we need support to find a new perspective and renewed courage to "fly" when it feels as though the odds are not in our favour. Having confronted and worked through challenges in my own life, I became a counsellor with a passion to help others find hope beyond their obstacles. I consider it an honour to create a safe place for people to process through their concerns.. I believe it’s important to be heard and understood for growth and change to happen. Together, we work to create clear goals and develop strategies that are realistic and achievable. I have experience working with a variety of concerns including: anxiety, depression, couple’s counselling, self-esteem, life transitions, grief, and boundary issues. I have special interest and training in working with couples. Having been married for over 20 years myself, I know both the reward and the challenge of working through relationship difficulties. I enjoy supporting couples as they work through challenges and move toward restoring their connection. I use a variety of therapeutic approaches to shape and guide my work with clients including: Emotionally Focussed Therapy, Attachment Theory, Mindfulness, Narrative Therapy, Solution-Focussed Therapy, Acceptance and Commitment Therapy (ACT) and Cognitive-Behavioural Therapy. When I am not counselling people, I enjoy writing, public speaking, having coffee with friends, hanging out with my family, walking, snowshoeing and shopping for bargains. I’m also told I laugh a lot. 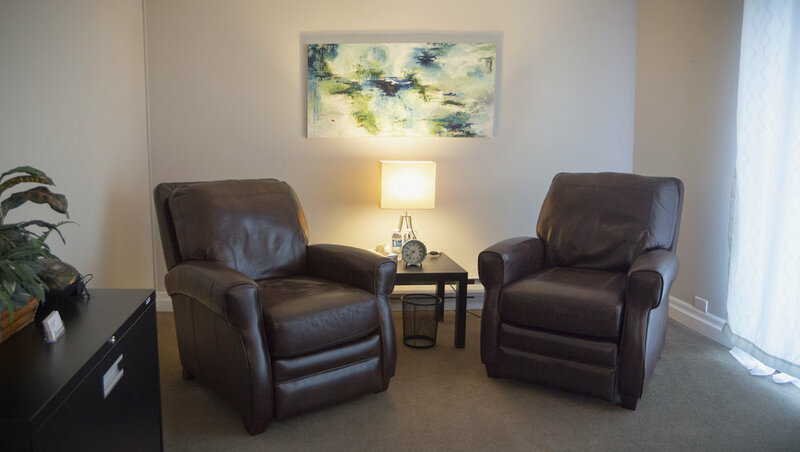 I know that finding a counselor who you feel comfortable talking to is important, so if you are considering counselling, but have further questions that need answered, I welcome you to contact me for a free phone consultation. I am a Registered Psychotherapist, hold an M.A. (Spiritual Care & Psychotherapy) and am a member of the Ontario Association of Consultants, Counsellors, Psychometrists and Psychotherapists (OACCPP). Regular sessions are scheduled to be 50-60 minutes at a fee of $100. Upon request, session length can be extended and will be charged at the same hourly rate of $100 per hour. I have limited sliding scale rates available. Feel free to contact me if you want further information about how the sliding scale works. If you have a benefit plan, please check to see if you are covered for counselling services with a Registered Psychotherapist. If you do have coverage I can issue you a receipt using my registration number and it will be your responsibility to submit it to your insurance company for reimbursement. My office is located within Central Pentecostal Church in Elora. There is plenty of parking available in the church parking lot. You can enter using the side door on the left side of the building. There is a small, window enclosed entrance. When you enter the building, my office is the first door on your right. If my office door is closed when you arrive, I am just finishing with another client. You are welcome to wait in the room beside my office. There are a few comfy rocking chairs in that room. rather I use space within the church to run my private practice. The best way to reach me is by filling in the contact information below. please call the toll free Mental Health Crisis Line at 1.844.437.3247 (or 1.844.here 24 7).